HO HO HO! 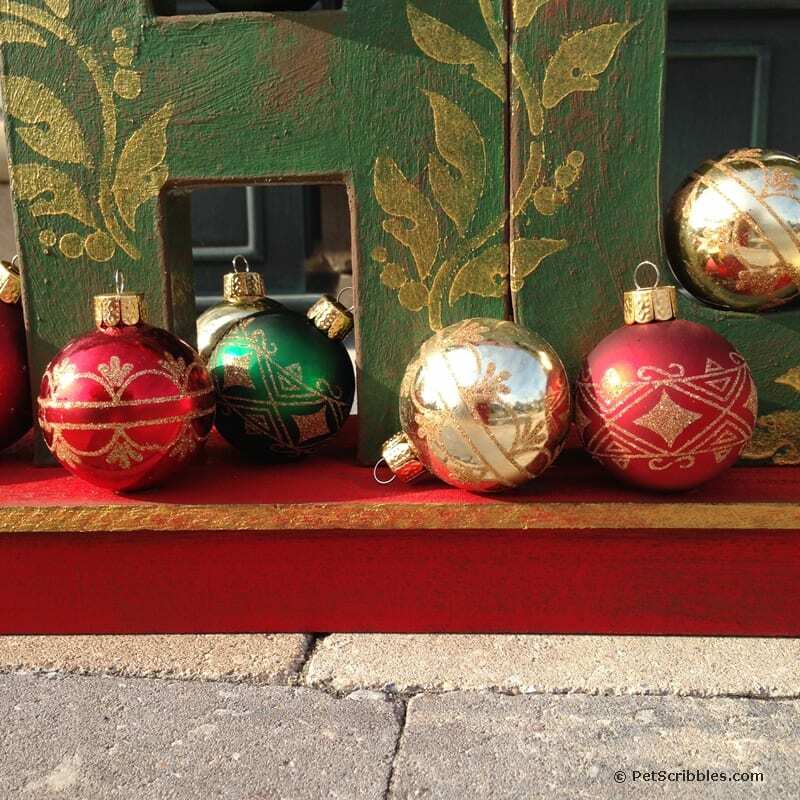 A festive Christmas sled display is easier to create than you might think. 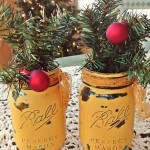 Learn how I made mine, then make one to match your own Christmas decor! 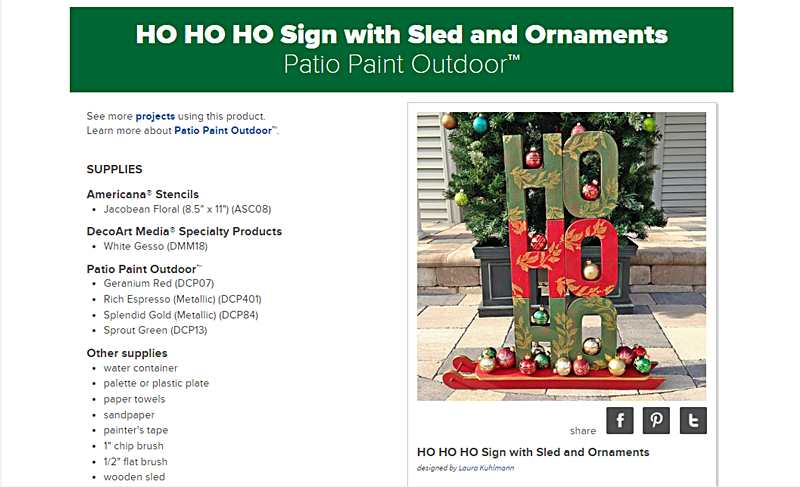 This HO HO HO sign may look complicated, but when you read through the steps — and see the helpful pictures — you’ll see it is pretty much a straight-forward painting project. 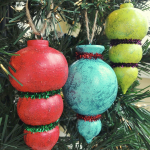 This is a sponsored holiday project for DecoArt. 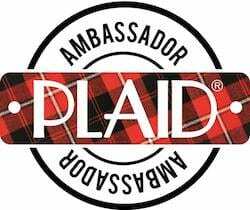 The project idea and tutorial are 100% my own. 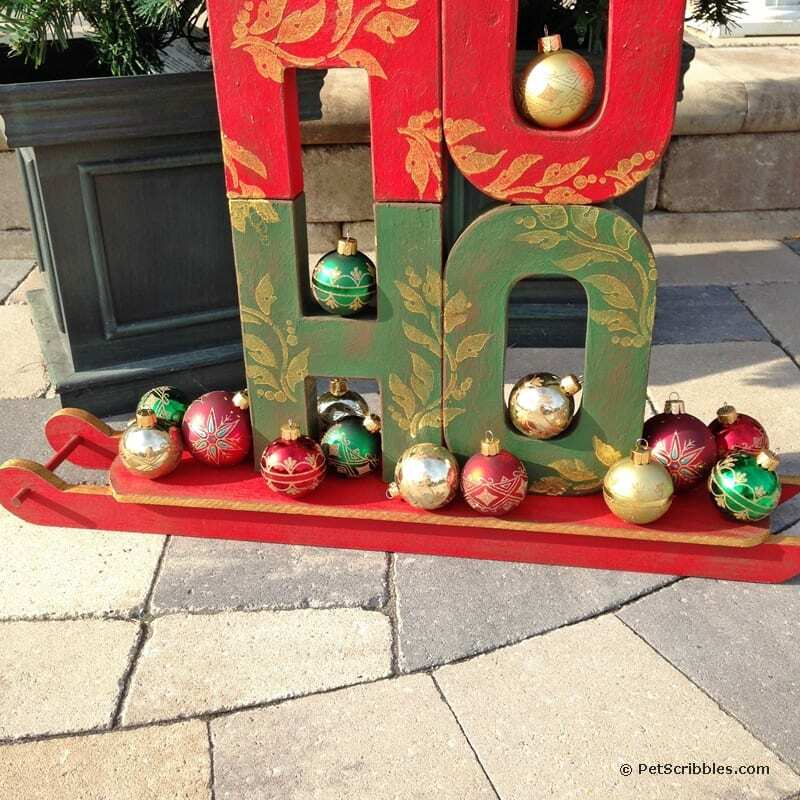 What makes this project unique is that I used outdoor paints and E6000 glue, so that my festive Christmas sled can easily handle the outdoor elements when displayed by our front entrance! 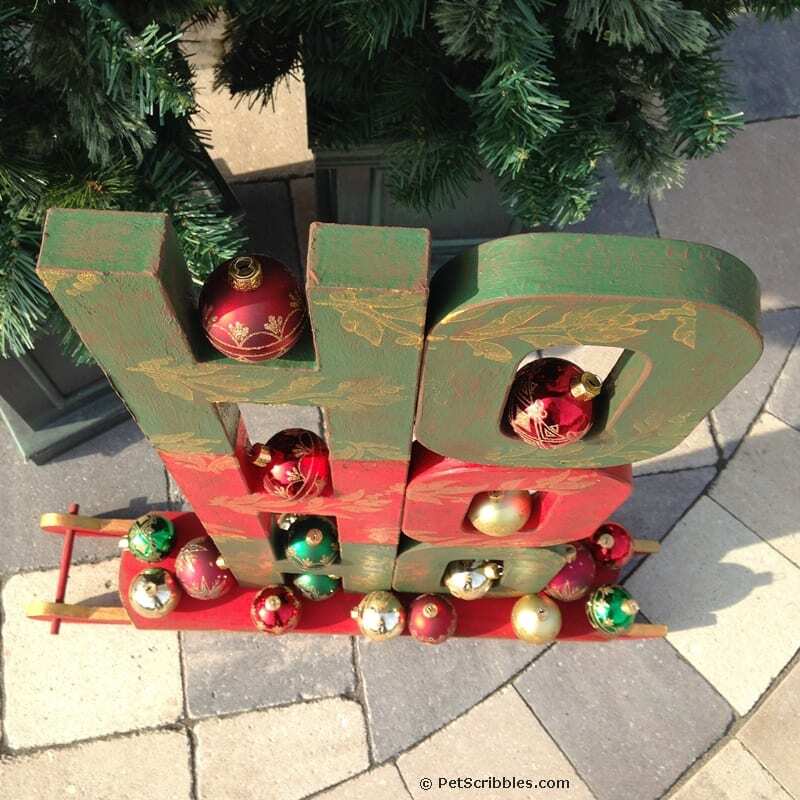 I found the paper maché letters and the unfinished wood sled at the craft store. 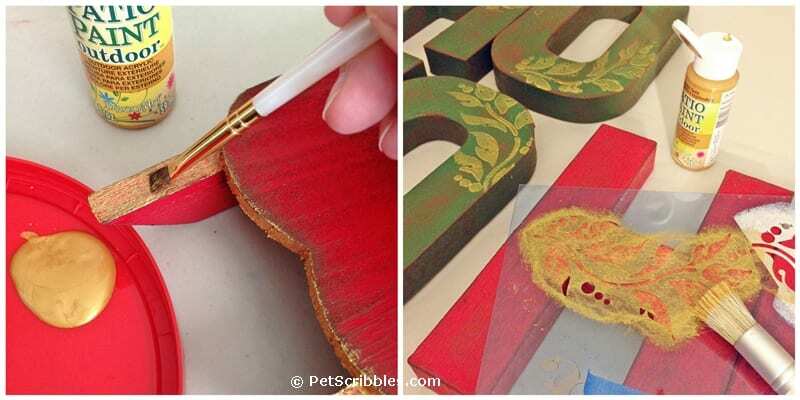 Helpful Tip: I purposely chose paper maché letters because of how lightweight they are. 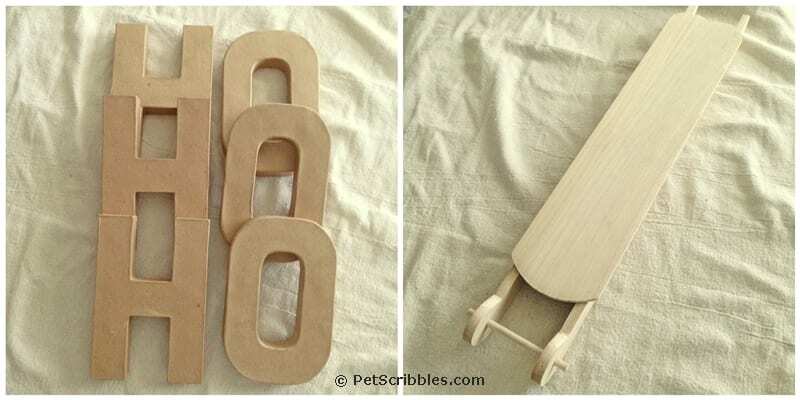 In the craft store, I balanced one set of HO letters onto the wood sled to make sure the size of the sled worked. 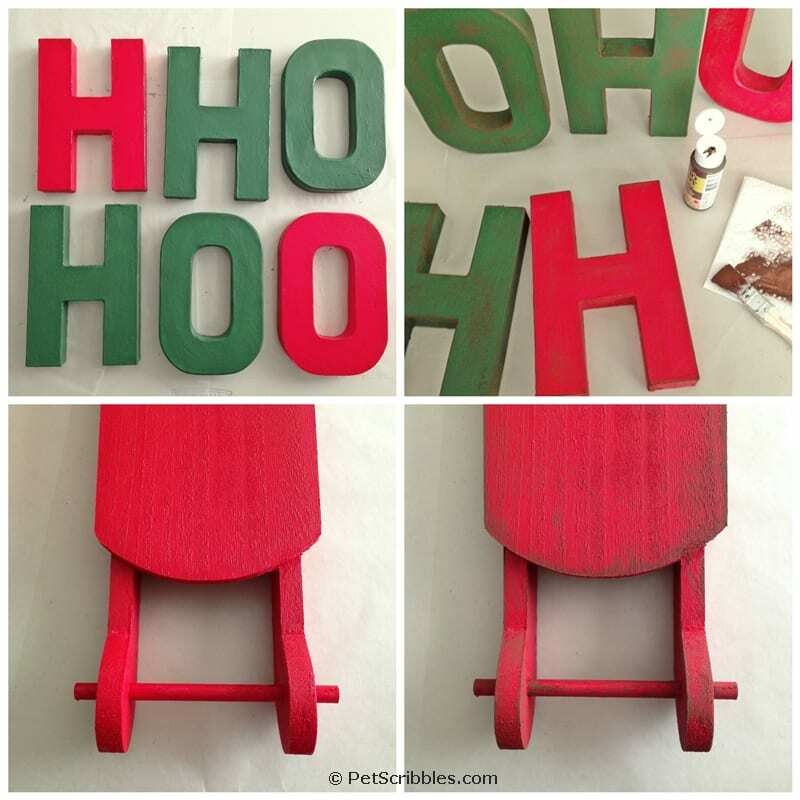 The letters and sled were painted in traditional red and green colors, then distressed with brown paint. 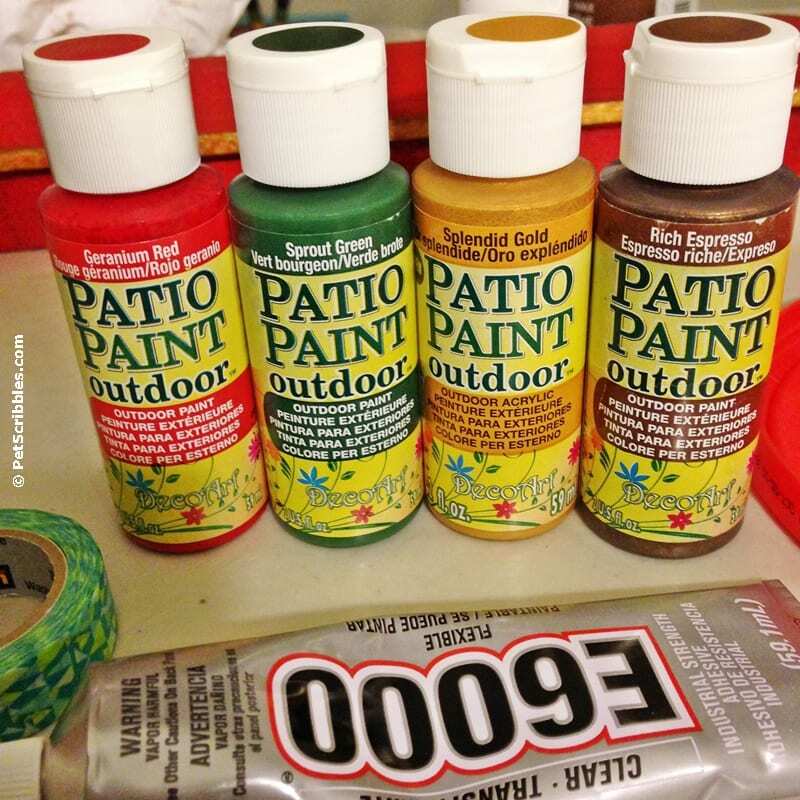 Once dry, it was time to add some metallic gold stencil designs. 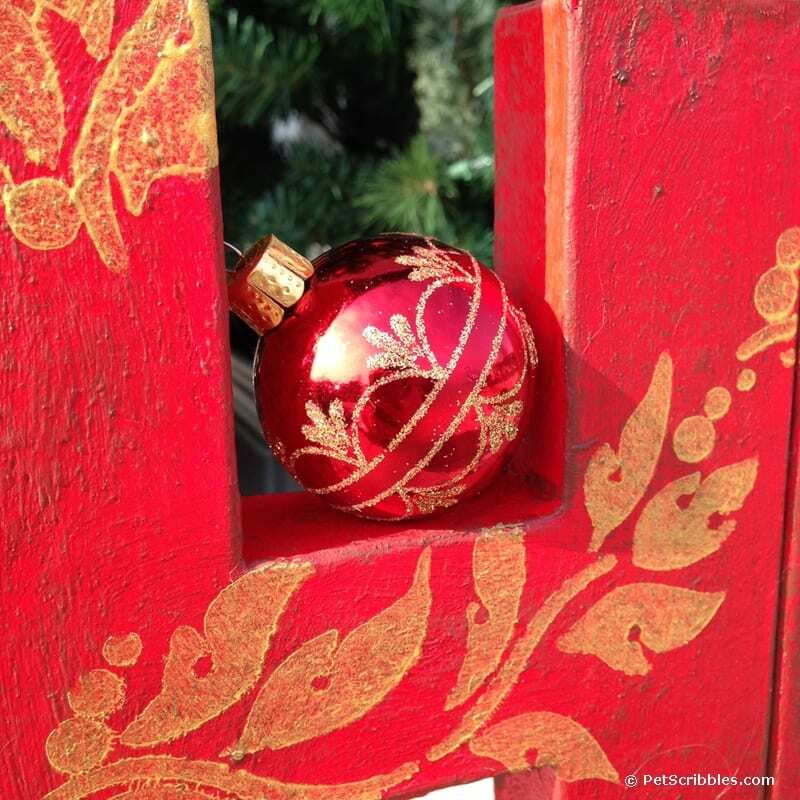 I chose a stencil that was similar to the designs on the classic ball ornaments which will become part of the final design. 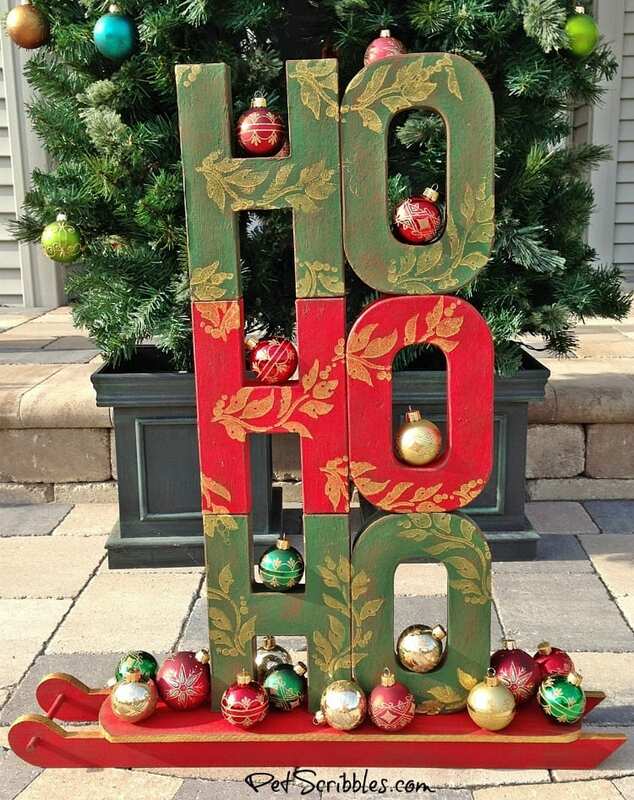 I also stenciled the design to overlap onto more than one letter, to help visually join the HO HO HO together. 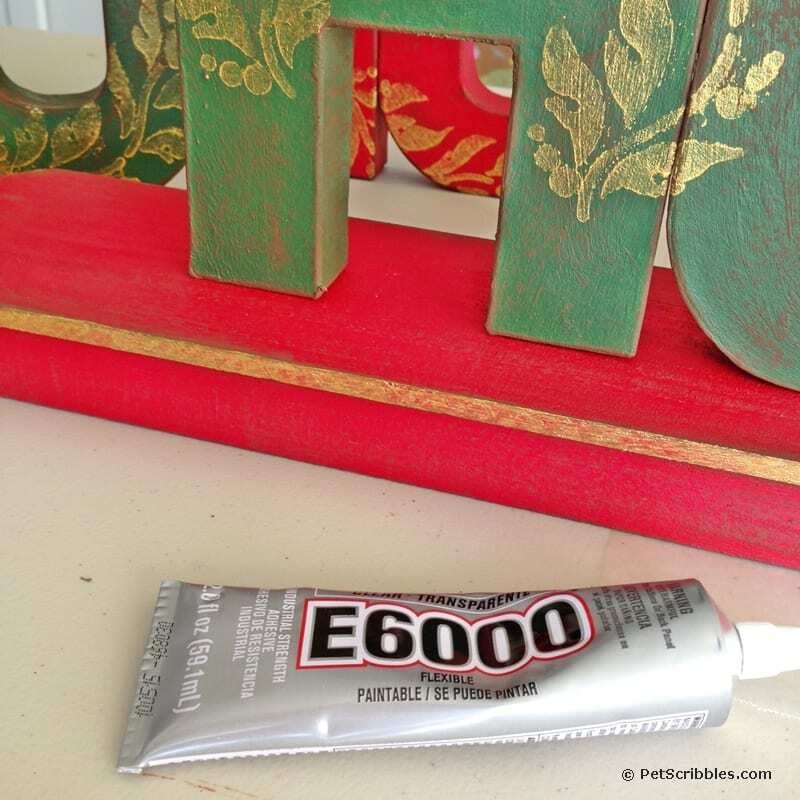 Once everything was dry, I put the entire display together — one section at a time — using E6000 glue. 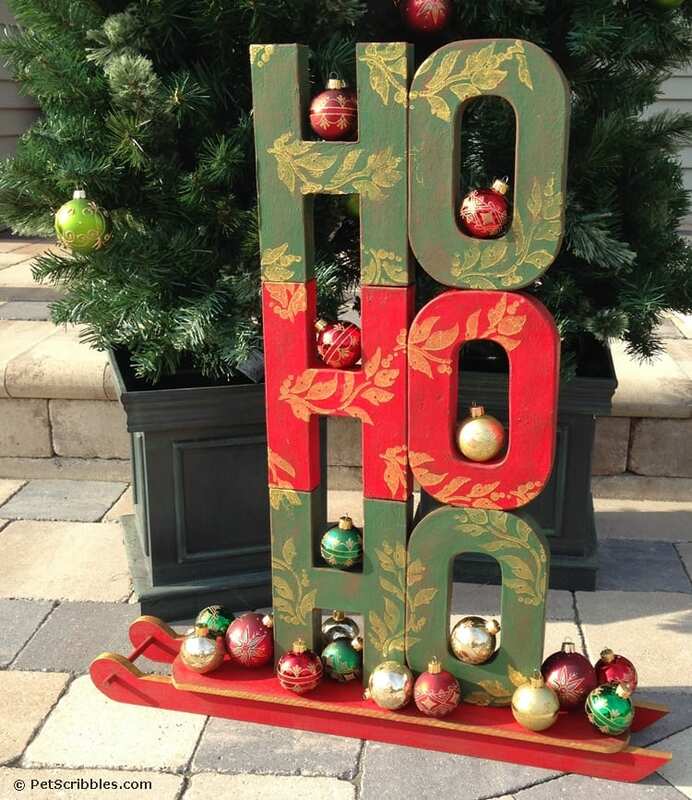 After the HO HO HO letters were attached to the sled and dry, I then began to add ornaments here and there — again, using E6000 glue. 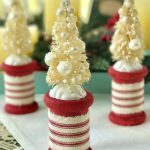 Some ornaments were on their sides, some were leaning together, others were upright — as if they sort of tumbled onto the sled. 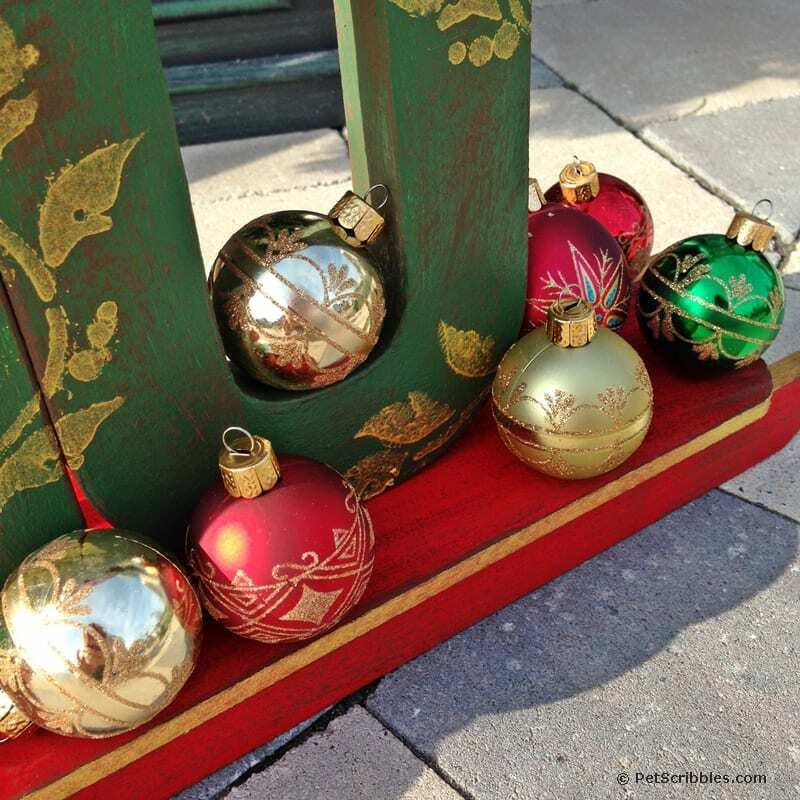 Helpful tip: If your sled is a little bigger like mine was, just add a cluster of ornaments to the left and/or right of the letters. 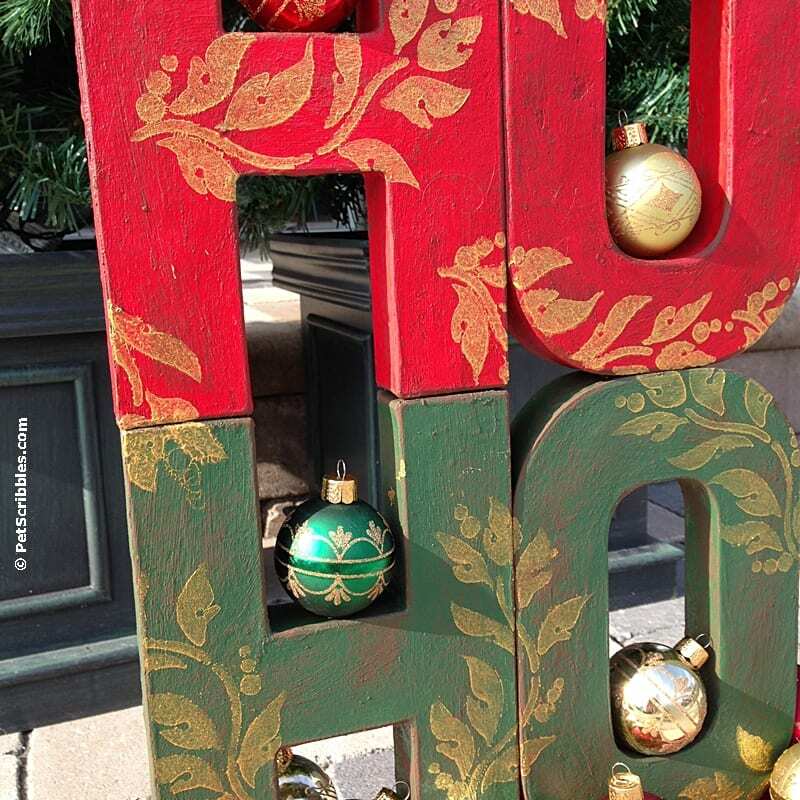 And don’t forget to glue some ornaments into the actual HO HO HO letters too! 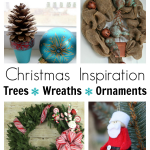 My step-by-step tutorial is live on the DecoArt website! 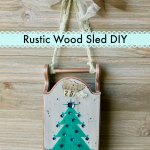 This tutorial includes a complete list of supplies plus many pictures to help you create your own festive Christmas sled display! 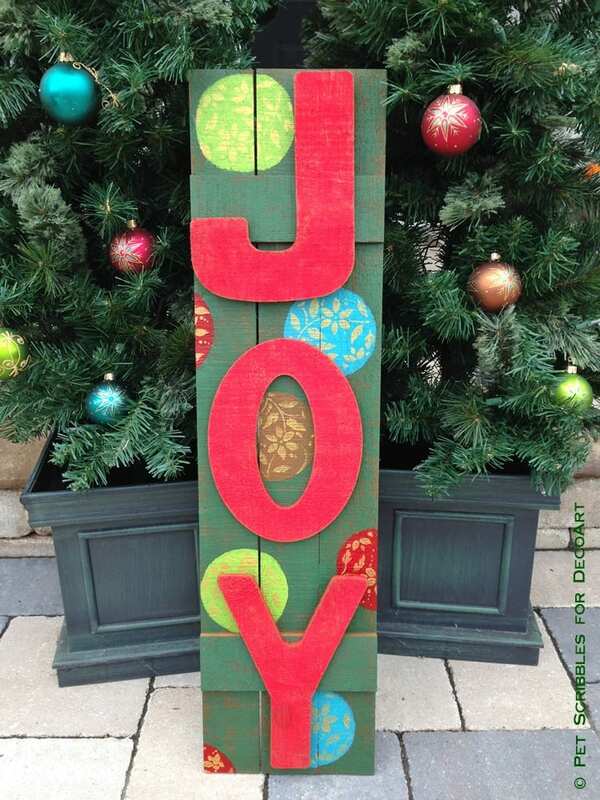 Want to see another outdoor-friendly Christmas sign that’s easy to put together? 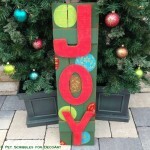 Check out my JOY Sign Tutorial here! Oooooo so very pretty! I would love to have one of these for my house! What fabulous work! 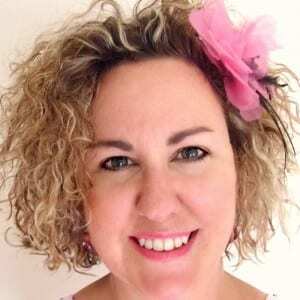 You did a great job with it Laura! Love the colors! !